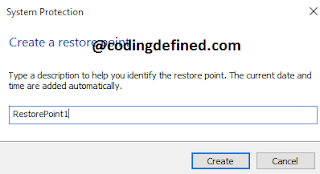 In this post we will be discussing about creating a system restore point in Windows 10. System Restore is a feature where you can create a number of system restore points and at any point of time you can restore your system to that point. Lets say you have installed a software which causes your computer to crash or your computer is not working properly then you can use the system restore point to go back to the earlier stage. 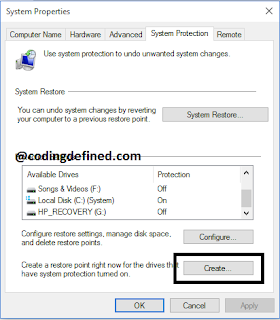 System restore points are automatically created if system protection is turned on for your drives. 1. Click on Recovery option of Control Panel. 2. Then Click on Configure System Restore. 3. Click on Create button to create System Restore Point. 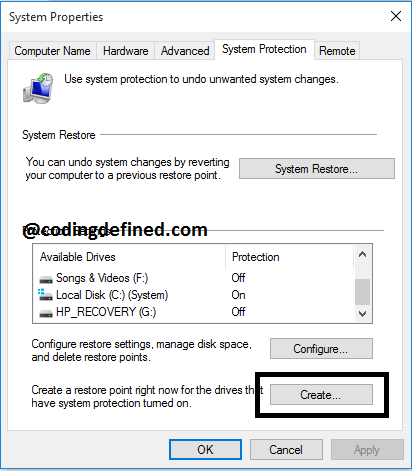 As you can see its written that it will only create restore point if the drives have system protection turned on. 4. Enter the description to the Restore Point to uniquely identify the Restore Point and then click Create to create a restore point. Hello, Phillip here. I am 78 years old and I came across this web page via google. I like the article as old timers like myself (ha ha ha) tend to prefer to stick with Microsoft products. 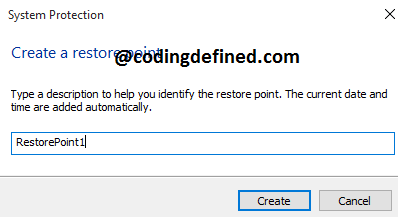 I have however had issues with failed restore points in Windows 8.1 and 10 specifically. I have found an alternative in a program called roll back rx but I would like to do some tests with Windows System Restore. I will follow this guide however you should help old timers like myself and include a video guide which is easier to follow.